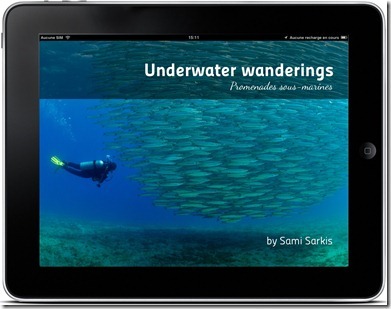 Royal AppBooks has published the new Photo book of Sami Sarkis, photographer, as an App for iTunes /App Store for iPads, iPhones and iPod Touch: “Underwater Wanderings”. “Photographer, filmmaker, diver, long distance traveler, Sami Sarkis offers in his first App his 183 most beautiful underwater shots, gleaned all over the world, this last fifteen years. In 1993, while filming whales in Argentina (Balaena by L. Hieulle) the author discovered the underwater world! When you get the incredible chance to make your first ever dive in the company of those huge but so delicate cetaceans, it is natural to contract the diving virus and to will, insatiably, discover the wonders of the Oceans. That's what this App reveals by inviting the reader to admire the beauty of a fragile world where there is so much still to explore and to preserve”. This entry was posted on Tuesday, June 19th, 2012 at 1:52 pm. It is filed under New Images, Underwater and tagged with A new Photo Book by Sami Sarkis as an App for ipad, iphone, ipod touch. You can follow any responses to this entry through the RSS 2.0 feed.